A Russian-made Iranian passenger plane carrying 168 people crashed shortly after takeoff Wednesday, smashing into a field northwest of the capital and shattering into flaming pieces. All on board were killed in Iran's worst air disaster in six years, officials said. The Russian-made Tupolev 154 is a Soviet-era workhorse, but the passenger jet has a less-than comforting safety record, reports CBS News correspondent Richard Roth, and Iran has often been criticized for poor plane maintenance. Roth reports that Iran has complained that its aviation safety is compromised by U.S. and international trade sanctions. The U.S. sanctions prevent Iran from updating American aircraft bought before the 1979 Islamic revolution and make it difficult to get European spare parts or planes as well. At Yerevan's airport, Tina Karapetian, 45, said she had been waiting for her sister and the sister's 6- and 11-year-old sons, who were due on the flight. "What will I do without them?" she said, weeping, before she collapsed to the floor. 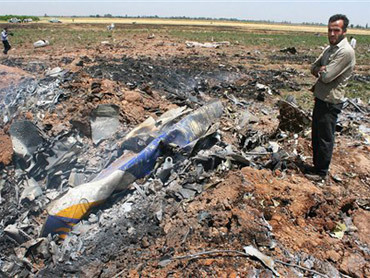 "The force of the crash was so serious that pieces of the aircraft were thrown over a 200 meter area. Unfortunately, all the bodies were totally destroyed," Behzadpour said.